Honda has announced plans to invest over $400 million in their Alliston, Ontario manufacturing plant. The investment is seen as an upgrade to facilitate the manufacturing of new models of the Honda Civic and CR-V. The investment is aided by the Canadian federal and provincial government who are each set to contribute $41.8 million in grants to Honda Canada. The $429 million investment will be used to prepare the plants’ main assembly lines and to build a new paint shop that will see greenhouse gas emissions cut by 44 percent from plants current process. The main assembly lines require updates in order to facilitate the manufacturing of the CR-V and Civic. The facility sits on 42 acres and consists of four plants, two for vehicle production, one for engine production and another for stamping forming. Honda Canada accounts for 17 percent of Ontario’s vehicle output according to Ontario’s Minister of Economic Development and Growth. That equals around 385,000 vehicles and 221,000 engines (2015 figures). The Alliston, Ontario Honda Canada manufacturing facility is located 100 km outside of Toronto and employs approximately 4,000 full-time and contract staff. The plant provides its employees with well-paying middle-class jobs in which they are repeatedly awarded for quality and product innovation. 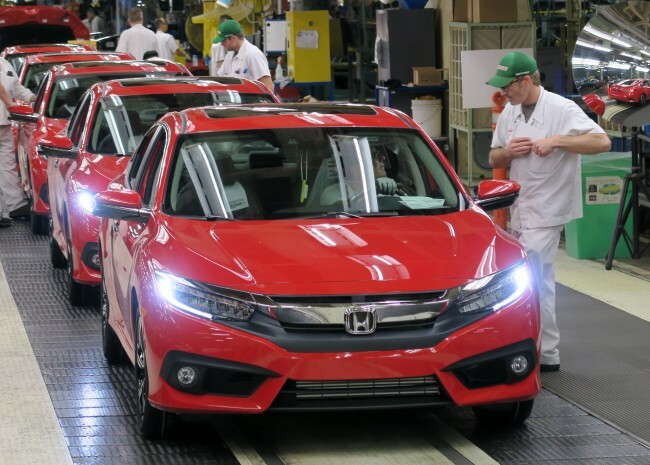 Honda Canada has invested over $1 billion over three years in upgrading its manufacturing plants, with this announcement the Globe and Mail stated that Honda will now commit an overall amount of over $2 billion in Canada. Investments from the federal and provincial governments will allow the Honda plant to position itself as a global centre for innovation. It is a Canadian investment in a world-class manufacturing platform and in clean manufacturing technologies. The investment comes from the part of the Government of Canada’s Automotive Innovation Fund which is committed to supporting automotive manufacturing in Canada. This announcement is important and it means that the same cars that your purchase at Henley Honda is St. Catharines were made just down the street is Alliston, Ontario.